← Getting ready for the week! Lamb is one of my favorite proteins to eat (duck is another—I know, I have very expensive tastes! ), and to me, Greek-style flavors seem to go really well with it. 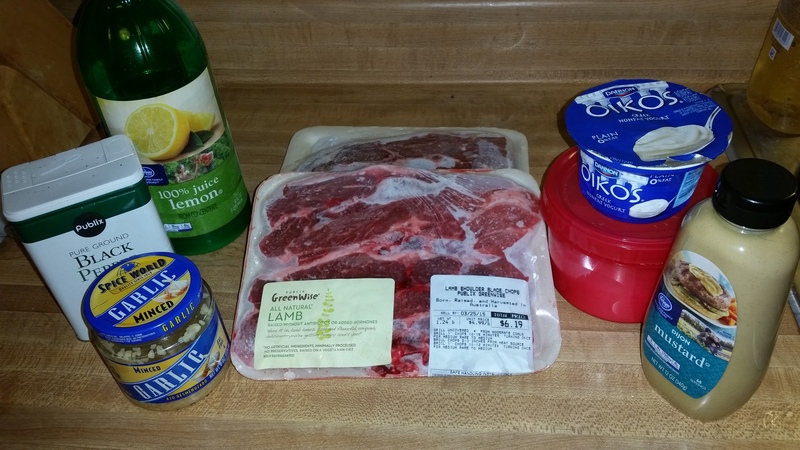 So while I’m sure this isn’t authentically Greek (thus my refusal to title this “Greek Marinated Lamb”), it has a flavor that reminds me of one of my favorite cuisines. If lamb is frozen, let thaw in fridge overnight. In zip-top bag, combine yogurt, mustard, oregano, garlic, lemon juice, olive oil, and salt and pepper. Seal bag and moosh around until ingredients are well combined. Add lamb chops and let marinate in the fridge at least two hours, up to overnight. Preheat cooking method—grill or broiler is up to you to figure out. Preheat skillet over medium-high heat. Remove lamb chops from bag and tap to remove excess marinade (it’s thick, so it’ll stick and you want the flavor, but it will also burn, so you want some but not thick gobs of it). When skillet is hot, sear both sides of the chop (1-2 minutes each side. Reduce heat to medium, and continue to cook 5-6 minutes per side, depending on thickness and desired doneness. I like my lamb medium rare, so a couple minutes of searing and then 4 or 5 minutes per side was perfect. As with any other meat, let it sit for a few minutes before cutting into it. 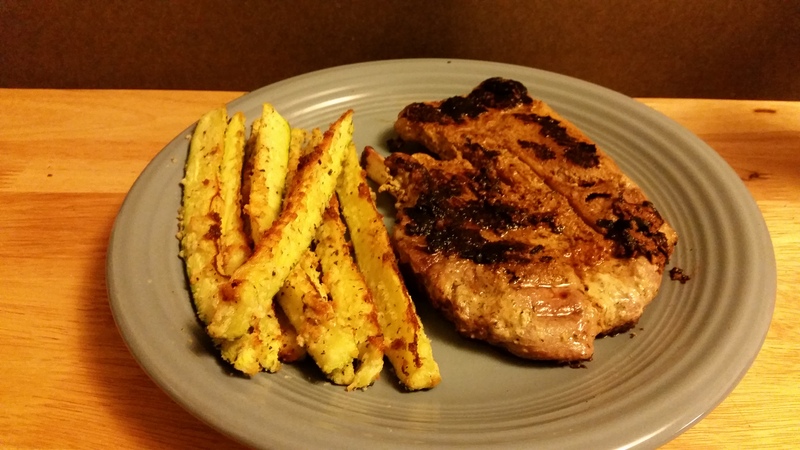 The entire marinade recipe has 17.5g net carbs. But less than a quarter of it actually sticks to the meat. I only had three chops to start with, and I had enough marinade for at least four to six more! Because there was so much leftover/unused marinade, I counted 1.5g net carbs per serving. It was sooooooooo good. I will definitely be making this again in the future! Looks awesome. I also love lamb. What do you think about this going on the grill? I went back and looked—she suggested to do two heat zones on the grill: one super hot, one medium. You’d do the same thing—a fast sear on both sides, then move it to the cooler side and continue cooking to desired doneness. That makes a lot of sense. Thanks for looking into it for me!